The summer heat is here, and I cannot change this. I suppose it is just as well that I am not in charge of the weather, because even the less-pleasant portions do good things. The garden is loving the hotter temperatures. However, I do not love them. In fact, I think they might be causing a wee bit of irritability in me. Yeah, pretending like that is not true does not make it so, but seeking out the positive might help improve the situation. Therefore, I decided that I might as well find a way to take advantage of the situation, too. I have always thought about solar dyeing, but never got around to it. That all changed the other day. I filled up a pot of water, fluffed up eight ounces of Shetland, and let it soak. Then I carried it outside to a sunny spot and returned with the colors. I am still not quite ready to move beyond the Kool-Aid dyeing, so that is what I used. I mixed up and poured in one packet each of black cherry, orange, and pink lemonade, as well as two packets of lemonade. Then it was time to cover and wait. After the dye was exhausted, it was time to wait some more. I carried in the big pot just in case a pop-up thunderbumper came along, and to allow it to cool. After it was out of the pot and out of the water, it was looking nice, and there only remained one more waiting period. After it dried, I took the time to admire my work. I liked it. Then I decided to get fancy and braid it. With success like that and the prediction of even hotter weather, another foray into solar dyeing seemed like the most logical decision. Alpaca seemed like a wonderful choice, and I just happened to have eight ounces waiting for action. For this attempt, I used one packet each of black cherry, grape, and blue raspberry lemonade. I wonder what the finished yarn will look like. Does your garden want the Kool-Aid dye-depleted wastewater from these dyeing efforts? If so, which plants want this water? Also, does it matter whether it is the water from the alpaca or the Shetland? If you water your garden with the wastewater from solar Kool-Aid dyeing, is it still an organic garden? Will watering the garden with the aforementioned liquid make the ants go away? If you are looking to me for gardening wisdom, your garden is in tremendous peril. At WWKIP Day, we all received little key chains, and got to choose a cute little knitting bag. I had to go for this one. I know it will be great for socks, but it keeps telling me that it needs to carry a new lace project. While WWSIP Day is not for months, there were still gifties for my drop spindles. They have new bags, too! I never showed you what I got for my anniversary. It is pretty and sparkly, and it has very little VM. I want to spend extra time with it, so I am spindling. I have two, two-ounce bags of a Cheviot, Silk, and Angelina blend (color is way off). I have been spindling a bit nearly every day. I have been enjoying the experience so much that the wheel is beginning to feel neglected. Of course, the fact that I have been stalking auctions in the hope of finding a super bargain on a wheel is also contributing to Kiwi's hurt feelings. I hope Kiwi can be happy about what is coming next. We celebrated our wedding anniversary earlier this month. We tend to keep things relatively low-key. The important thing to us is spending time together. We went to see Up at the movie theater. I also gave him his anniversary present. Time Spent: I drew this bag from the psc collection while Bruce was in the hospital in April, and then proceeded to carry it with me everywhere, unable to begin them for a bit. I do not recall just when I started and finished them, but I quite enjoyed knitting these. 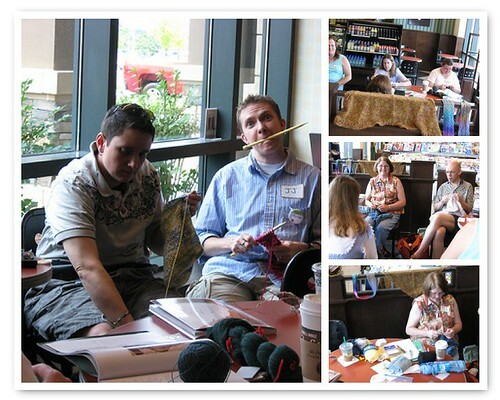 I slept Friday night, so I made it out to knit with everyone Saturday morning for WWKIP Day. We had a great time, and even got a little knitting done. Perhaps you can ponder this sign while I try to finish a few things. I actually have one something done that is just waiting for photos, and am about halfway through with another something. As for the GVC, I froze up when it came time to add buttonholes. I finally relaxed, and am knitting away on it. I have also been spindling, and am ready to put something new on the wheel, too. With all of that going on, I might be a bit optimistic about finishing things. I love when I have made something and am so pleased with what I have made that I can hardly wait until I can gift it to the recipient. Most of the time, I can at least share the finished product here on the blog. Then there are the times when I just have to wait. One of our Skanky Knitters, Helen, had heart surgery several weeks ago. When I knew Helen was going to have surgery, I knew I would make something for her, but had a difficult time deciding just what it should be. When I finally made a decision, I was excited. When it was finished, I was on cloud nine. Then I had to wait. I had planned to bring her little present to the knit night she hosted in her home a few weeks back, but I still had remnants of the crud. So, the get-well gift waited. I thought of Helen every time I saw it. Monday night was her return to getting out to knit with everyone, and we are glad to have her back. I was also excited to finally be able to give this to her. It is a skein of handspun yarn, with an accompanying, bonus, mill end, mini-skein. Children certainly can eat a lot of Cheerios, mac and cheese, chicken, and sandwiches. However, this is nothing compared to the way they devour time. What was meant to be one overnight and day with one child turned into three. Halfway through day two, we added another kiddo to the mix. It went pretty well, but I may never get the music from Mario Kart to leave my brain. While this left little time for knitting, I have managed to get a little bit done. Twice I became caught up in the rhythm of my knitting and had to rip back a few inches each time. I could be close to done with the second front of my GVC if not for these setbacks, but I do not care. This is such an enjoyable knit, that the only thing on my mind is fit. Some of my clothes feel a bit tighter than they used to be, and I know they did not shrink o.O Anyway, at least now I am feeling more confident that I will have enough yarn to knit the sweater. 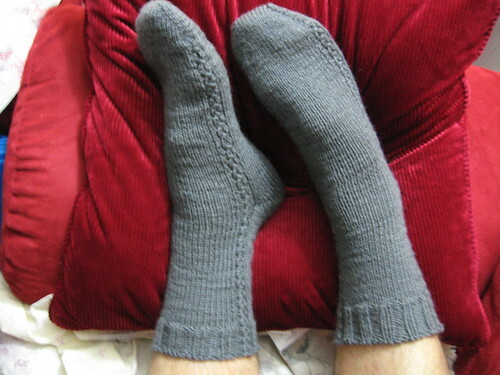 Things are going so well, that I feel like knitting socks. This is good, as it is time to draw another bag from the psc collection. No, we will not mention how woefully behind I am on this (or everything else). I have also begun a long term knitting odyssey that will either be one of the best ideas I have had this year, or never mentioned again. Either way, I may not know the answer for a few months.